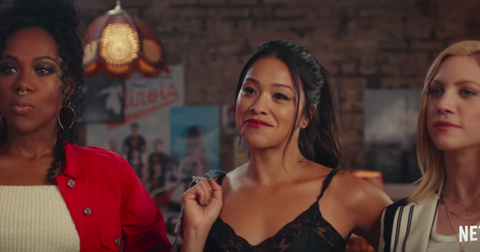 What with the exposés on Fyre Festival, Aunt Becky and Lynette Scavo scamming their kids' way into college and most recently, HBO's new The Inventor: Out for Blood in Silicon Valley, it doesn't seem like a stretch to dub 2019 the year of the grifter. 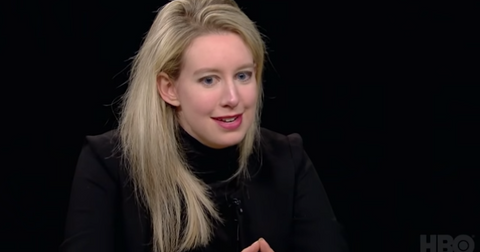 Since The Inventor just hit HBO yesterday, we wanted to take the chance to answer all of your most pressing questions about Elizabeth Holmes, 35, the Stanford dropout who founded Theranos, a blood-testing company that went from being valued at $9 billion in 2014 to getting completely shut down in 2016 for posing an "immediate jeopardy to patient health and safety" and proving massively fraudulent. If you're wondering about Elizabeth Holmes' voice, whether she's a psychopath and if she still dates former Theranos COO Sunny Balwani, you've come to the right place. First, what is up with Elizabeth Holmes' voice? 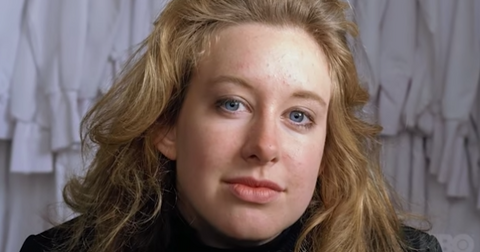 When viewers put on The Inventor for the first time, many (myself included) were startled by Elizabeth Holmes' baritone voice. In fact, Twitter was popping off about this one detail over the course of the evening, and we expect those who haven't yet tuned in will soon jump on the social media train. "Anyone who has ever criticized a woman's vocal fry or uptalk or 'shrill' tone needs to watch the Elizabeth Holmes documentary," wrote one user. "She has the perfect voice [some] of you guys have been dreaming of all your lives! I'm very excited for you to finally hear it come to life." 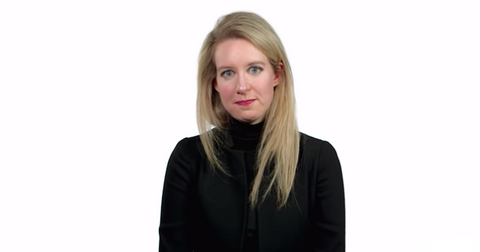 "We are four minutes in on this #Theranos doc on HBO and I cannot stop laughing at Elizabeth Holmes' 'deep voice'," added another. Jezebel even went so far as to publish an article today called "Elizabeth Holmes's Fake Voice Is Actually Just 'Stupid Man' Voice," and all signs point to the fact that Elizabeth doesn't actually speak in such a low register and just put it on for, you know, kicks. In fact, the only person who was ever suspect of Elizabeth during a time when everyone else was pouring millions into her company, was Dr. Phyllis Gardner, MD, a professor of medicine at Stanford. She commented on Elizabeth's fake baritone in ABC News' podcast, The Dropout: "When she came to me, she didn't have a low voice," she revealed. "When I saw her again was at the Harvard Medical School board meeting where she was being introduced. She says with this low voice and I'm like, 'Oh my god.' It was quite off." If you want to hear Elizabeth's real voice (you're welcome), there are instances where she slips out of her fake baritone, and they're extensively catalogued here, courtesy of reddit. Is Elizabeth Holmes a psychopath? While psychopaths and sociopaths are often confused, Elizabeth definitely exhibits features of the latter. 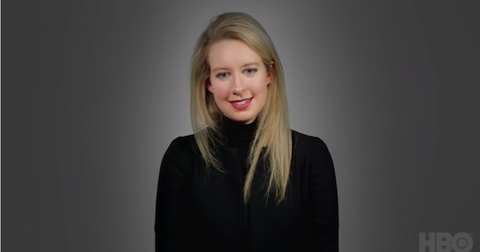 John Carreyrou, author of Bad Blood: Secrets and Lies in a Silicon Valley Startup, has spent some time studying Theranos and its inventor and opened up about her sociopathic behavior in an interview with Vanity Fair. "At the end of my book, I say that a sociopath is described as someone with no conscience," he said. "I think she absolutely has sociopathic tendencies. One of those tendencies is pathological lying. 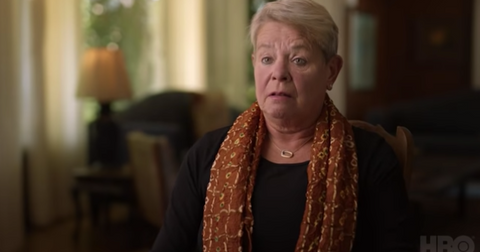 I believe this is a woman who started telling small lies soon after she dropped out of Stanford, when she founded her company, and the lies became bigger and bigger." "I think she's someone that got used to telling lies so often, and the lies got so much bigger that eventually the line between the lies and reality blurred for her," John said. Is Elizabeth still dating secret boyfriend Sunny Balwani, former Theranos president? 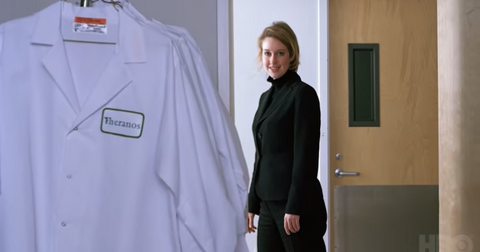 One of the most striking details the HBO documentary explores is how Elizabeth was secretly dating and living with Ramesh "Sunny" Balwani, the president and COO of Theranos the entire time they were working together. Although they met when Elizabeth was 18 and Sunny was 37, they reportedly didn't start dating until two years later, when Elizabeth dropped out of Stanford in 2004. Per John's book, the couple was living together by July 2005, though Elizabeth "actively lied" about her relationship status the whole time she was at Theranos. These days, that couple is history — and their breakup will probably go down as one of the most dramatic and disastrous in history. According to Refinery29, "Holmes got rid of Balwani from both her personal and professional life" in the spring of 2016. But it's not like Sunny can just chill and get over his former flame; in March 2016, he was banned from owning or operating a blood laboratory. In 2018, the Securities and Exchange Commission filed four claims against him for lying to and intentionally misleading investors. And last June, a federal grand jury indicted Sunny and Elizabeth on nine counts of wire fraud and two counts of conspiracy to commit wire fraud for knowingly distributing blood test with falsified results. Because he claims he didn't make any money off of his time at Theranos, Sunny holds he shouldn't be held responsible and according to his legal rep, has "committed no crimes." Where is Elizabeth Holmes today? Who's her new fiancé? It's wild to think that someone could know Elizabeth's full story and still want to marry her, but there's someone for everyone, as they say. And it seems Elizabeth Holmes, who's currently awaiting her trial in San Francisco, is a fan of May-December relationships because she's currently engaged to a certain Billy Evans, 27, who's eight years her junior. According to Vanity Fair, Billy is the heir to the Evans hotel fortune, so he should be equipped to take care of Elizabeth, whose net worth dropped from $4.5 billion in 2015 to zero. "The pair share a luxury apartment in San Francisco, are co-parents to the Theranos founder's wolf-dog Balto and even traveled off to Burning Man last year to party in the desert as the doors to Holmes' company were shut for good," according to Vanity Fair. Of course, Elizabeth is currently laying low and not commenting publicly on her relationship status, and we weren't able to track down Billy's Facebook or Instagram account either, so we don't know for sure when the wedding bells are set to ring.